The midsize sedan segment is a popular one, and customers have all kinds of different models to choose from. Deciding which model to go with can be tough, which is why we have put this blog post together to help you make an informed decision. For the purposes of this piece, we are going to look at the 2018 versions of the most popular models in the segment. 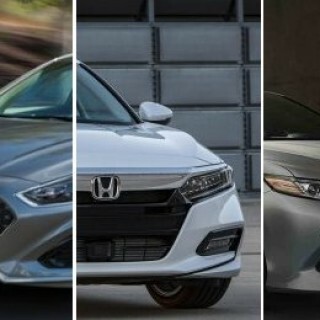 The vehicles in question are the facelifted Hyundai Sonata, the newly redesigned Honda Accord, and the Toyota Camry. Keep in mind that since these are all upcoming 2018 models, some of the details for each may still no be revealed. There are still plenty of things that we can compare, though, such as dimensions, both inside and out, engine choices, fuel type, and more. We have created easy to read tables to make it easier for you to compare. The first thing we are going to look at is the size of all three midsize sedans. As the table below shows, the Camry and Accord are the same size, while the Sonata comes in 1 inch shorter. The wheelbase is also longer on the Camry and Accord, but neither size difference is enough to make any real difference. As far as height and width goes, the Sonata is a bit bigger than the competition. Now that we have the exterior covered, let’s take a look at the interior dimensions of all three vehicles. If it’s roominess on the inside you are after, then it’s the Sonata that leads the way. The 2018 Hyundai Sonata comes out on top in a number of areas, which are for front and rear headroom, front legroom, rear shoulder room, rear hip room and passenger volume. The 2018 Honda Accord has the best numbers for rear legroom, front shoulder room, rear shoulder room and trunk volume, while the 2018 Toyota Camry leads the way in rear headroom and front hip room. The table above shows some of the most important interior measurements and dimensions. Some of the differences in space on the interior are basically negligible, but where you will notice the space difference is when you pop the trunk. Families love to load up the trunk of their sedan and head out on road trips, which is why trunk volume is a key element in deciding which vehicle to go with. The table here shows the trunk volume of all three midsize sedans. 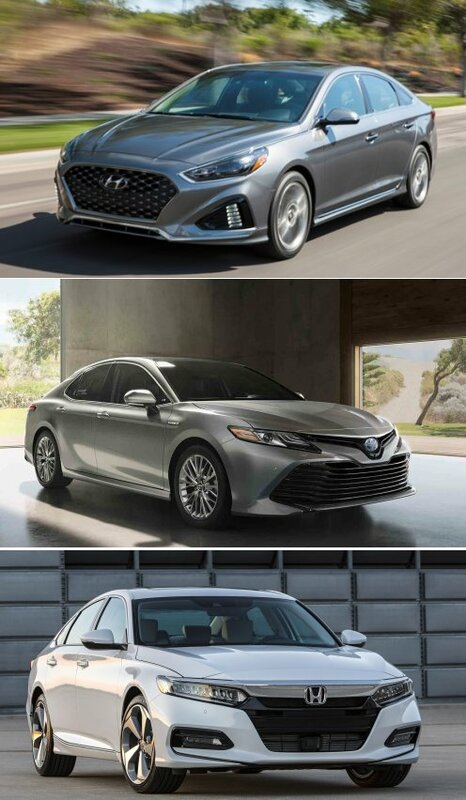 While all three models do a nice job of delivering volume, it is the Sonata and Camry that beat the Accord. All three cars that we are comparing here come with multiple engine options, which includes hybrid powertrains. For the purposes of this piece, we are comparing the engines used in the base models. All three are fitted with gas-powered 4-cylinder engines, with the Camry coming out on top in horsepower at 203, while the Accord has the highest torque at 192. The Sonata facelift trails both models, but only just, and not so much that you would feel a real difference in power.